David Livingstone made his way to Lake Nyasa in 1859, and Nyasaland was formed as part of the British Empire. A thin strip of territory along the banks of Lake Nyasa (Now Lake Malawi). 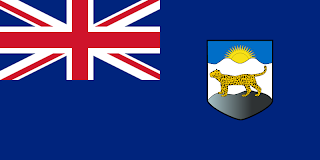 The flag of Nyasaland was the standard British blue ensign. The emblem placed on the fly of the flag consisted of a leopard in the fore, and a sun rising over the mountains. The Malawi flag takes the pan-African colours and switches them around. The Malawi flag runs black, red, and green. Located above the red stripe, and in the black, is a rising sun in red. 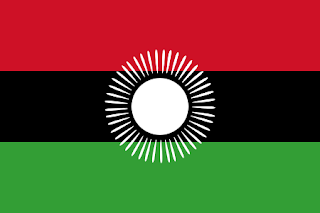 The sun represents the dawn of hope, and of a new age for Malawi, the black represents the people of Malawi, the red represents the blood shed, and the green represents the nature of Malawi. 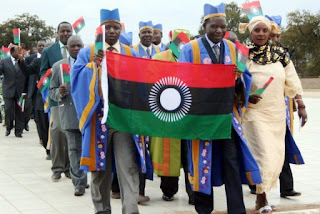 As of July 29 2010, Malawi had adopted a new flag. This flag has been introduced with some degree of public discomfort. With many wondering why a new flag was needed at a time when the world economy was in recession, and Malawi was struggling. Replacing old flags, and replacing them with new would prove expensive. Also, the government had outlawed the old flag, thus forcing people to buy the new one! The new government passed the new flag into law, and the opposition is now in the process of appealing the governments decision through the courts. Trying to bring the old flag back. The new flag switches the stripes around. The green moves to the bottom of the flag, black is now in the middle, and the top is red. This takes the flag back to the general pan-African pattern. The rising sun introduced in 1964 to symbolise the rising of the nation has been removed, and replaced with a full white sun. This is to represent the fact that Malawi has made significant strides forward as an independent nation from 1964.